style of hunts, hunting conditions and additional facts for the hunter. An interactive map is available to search by hunting area. 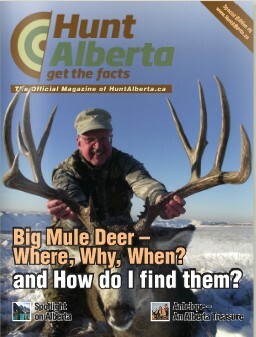 Enjoy this website as a tool to decide that your next big game hunt should be in Alberta. Alberta's climate and rich soil produce conditions ideal for developing large, healthy animals. As a result, Alberta wildlife tends to fill a large portion of the record books and many animals are the largest of their kind with big racks/horns and lots of body mass. Long seasons and generous limits are an Alberta tradition. In many areas the season is open for three months, which is ample time for bagging a great trophy. Alberta Professional Outfitters Society (APOS) was formed with a commitment to ensure standards and ethics for all outfitter members. Each outfitter is registered, licensed, and fully bonded and insured. Licensing qualifications demand demonstrated expertise and proficiency in the wilderness arts and first aid. APOS is the only outfitter organization officially recognized and supported by the government of the province of Alberta. Highly responsible professionalism is to be expected from any member of the Alberta Professional Outfitters Society. Guests can be assured of top quality service. Anchor D High Mountain Hunts Ltd.